Sunswift Violet, a sleek four-seat sedan designed and built by engineering students at UNSW, left Sydney on Wednesday on a 4,300 km drive to Darwin, where it will compete in the Bridgestone World Solar Challenge. It is the sixth-generation solar car created by the UNSW Solar Racing Team Sunswift (EV News had the opportunity to test Sunswift eVe back in 2014), built for practicality, speed and endurance, combining cutting-edge technology with modern comfort. 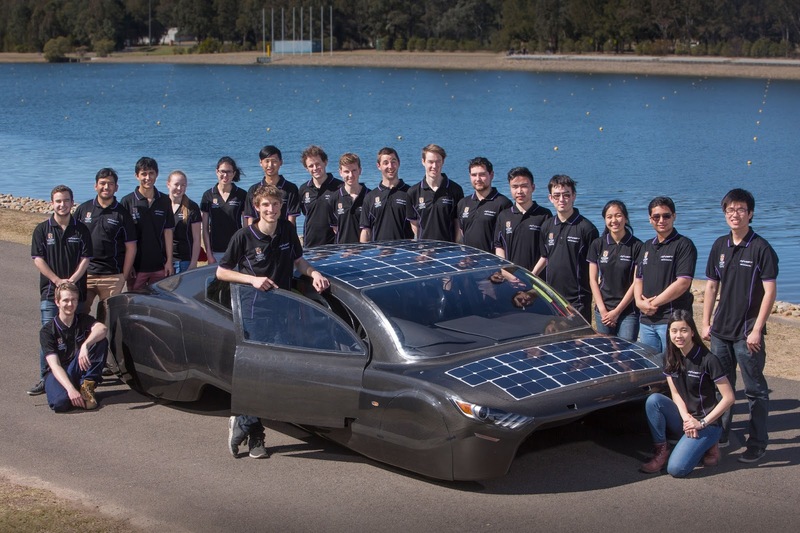 Sunswift Violet will be battling 47 teams from 21 nations in the 3,021 km race from Darwin to Adelaide, which begins on Sunday 8 October 2017. 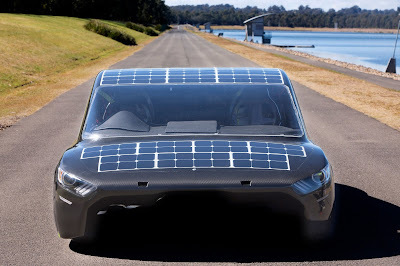 It has a top speed of 130 km/h and a range of 800 km running just on its rooftop solar panels. 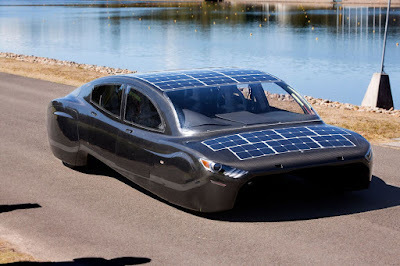 It also sports modular lithium-ion batteries which store power from the sun; running just on its batteries, it has a range of 400 km. The vehicle relies on around 7kW of horsepower at 110km/h, and two 1.5kW motors that run at 98% efficiency. 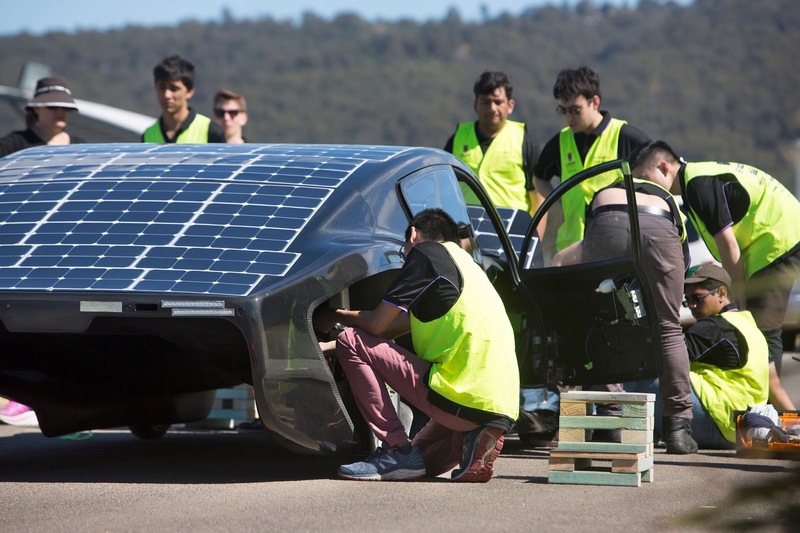 With a twill carbon-fibre monocoque chassis, Sunswift Violet weighs less than 400kg. And because good aerodynamics are vital in the quest for energy efficiency – the more slippery the car, the better – Sunswift Violet has a drag coefficient below 0.2, better than the best wind-cheating cars on the market. 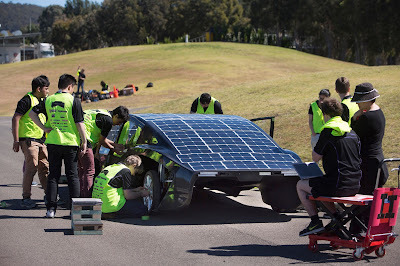 While undergoing race testing at the Sydney Motorsport speedway in Eastern Creek late last week, the car experienced a mishap: a bolt on the left-hand front suspension fractured during intense speed braking tests, causing the car to drop onto the roadway and skid for some 30 metres. There were four students aboard at the time, but no-one was hurt. 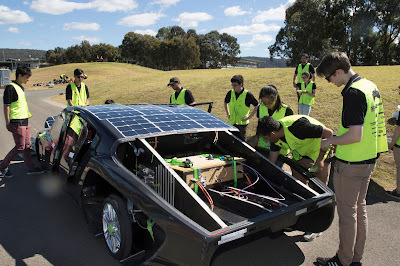 Despite the setback, the team of undergraduate students worked late nights and over the weekend to repair the damage and reinforce all the dynamic systems of the car, in order meet their original schedule. The Sunswift team holds the world land-speed record for an electric vehicle, recognised in 2014 by the Fédération Internationale de l’Automobile, when their previous vehicle – Sunswift eVe – travelled at an average 100 km/h over a distance of 500 km on a single charge. This broke a record that had stood for 26 years, and was recognised with a world record trophy. Teams competing in this year’s Bridgestone World Solar Challenge come from Belgium, Canada, Chile, Germany, Hong Kong, India, Iran, Japan, Malaysia, the Netherlands, Poland, Singapore, South Africa, South Korea, Sweden, Taiwan, Thailand, Turkey, the United Kingdom and the United States as well as Australia.